Our High Performance 6500™ 7" LED headlights are specifically designed for use with Land Rover Defenders. Our Plug and Play design enables quick and easy installation to your Defender in place of the original sealed-beam headlights. 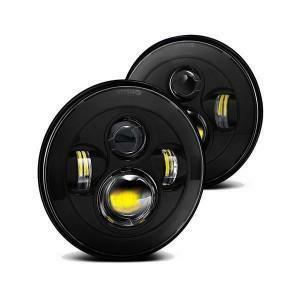 Our 6500™ LED Headlights offer 3600lm (High Beam) /2700lm (Low Beam) RAW and are easily adjusted using the standard Land Rover headlight adjustment bezels. Instantly upgrade the look of your Defender with our road legal & E Marked LED lights. Absolutely fantastic LED headlights, they are like day light compared to the original Land Rover headlights. The lights are a solid unit and are very high quality. After a year of having them, I contacted Thomas as I was having problems with the headlights (turned out to be a wiring Issue) and he offered advice within 20 minutes of my email. Fantastic customer service, even after a year. Encouraged by the previous review (thanks for that) I bought these headlights and and very pleased with them. I was a bit concerned that the black might look a bit severe, but not so and they blend very well with the ‘Brunel’ grey headlight surrounds and original sidelights and indicator, which I intend to keep to maintain the Defender character. Output is very good. Simple to fit too.